KGOU's Jacob McCleland talks with Journal Record senior reporter and digital strategist Sarah Terry Cobo. Health care providers are lining up behind a proposal to increase Oklahoma’s sales tax on cigarettes by $1.50. The proposal is also attracting the supports of child advocacy groups. Sarah Terry Cobo writes in the Journal Record that health care groups such as the Oklahoma Association of Health Care Providers, the Oklahoma Tobacco Research Center at the Stephenson Cancer Center and the American Heart Association are all supporting the measure. Tobacco use is in the number one cause of preventable death in Oklahoma. Joe Dorman, the CEO of the Oklahoma Institute for Child Advocacy, also support the bill. His organization advocates for child-friendly laws. The additional tax revenue would provide a boost for agencies that support children. About 7 percent of children in Oklahoma don’t have health insurance, even though SoonerCare should cover them. Dorman, a former House member, said legislators must hear from their constituents on the issue. During our weekly conversation about business in the state, Terry Cobo told KGOU that child advocacy groups are in favor of the tax proposal because it could prevent 28,000 children from picking up the habit. Terry Cobo says nursing home advocates, such as Nico Gomez of the Oklahoma Association of Health Care Providers, support the bill because they hope it can give them a boost. “About seventy percent of all every nursing home residents rely on Medicaid. And federal money has been declining since at least 2010. And so, because of inflation it means it’s more expensive to care for elderly people. So nursing homes face the real possibility of closing,” Terry Cobo said. House Bill 1841 is authored by Rep. Leslie Osborn, R-Mustang, and has the backing of Oklahoma Gov. Mary Fallin. Jacob McCleland: Sarah, it isn’t surprising that health care providers are in favor of the cigarette tax increase. 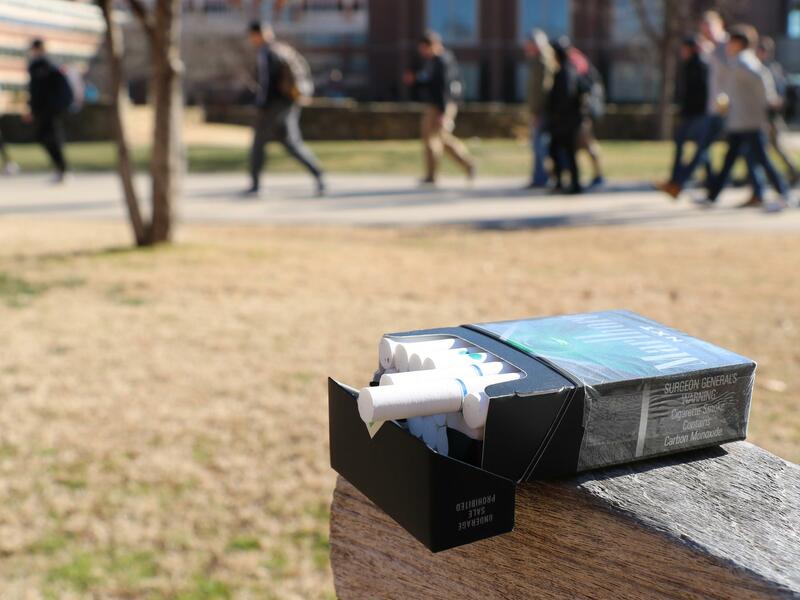 Smoking is Oklahoma’s leading cause of preventable death, after all. Why are child advocacy groups behind this proposal? Sarah Terry Cobo: Well Jacob, it could prevent about 28,000 children from picking up the habit, just from raising cigarette prices. Another reason is that part of the tax money will fund the agencies that support children, including the health insurance. There are about seven percent of Oklahoma children who do not have health insurance. McCleland: In your story about this topic, you mention this bill by state representative Leslie Osborn would send that tax revenue to state agencies the rely on matching federal health care dollars. What are those agencies? Terry Cobo: So that’s the Medicaid agency, the Oklahoma Health Care Authority, and that provides health insurance for children and low-income folks. But it also includes Indian Health Services as well. McCleland: You spoke with Nico Gomez in your story. He pushed for similar legislation last year when he was the head of the Oklahoma Healthcare Authority. Now he leads the Oklahoma Association of Health Care Providers, which advocates for nursing homes. How would the tax increase help nursing home patients? Terry Cobo: So it’s interesting, Jacob. About seventy percent of all every nursing home residents rely on Medicaid. And federal money has been declining since at least 2010. And so, because of inflation it means it’s more expensive to care for elderly people. So nursing homes face the real possibility of closing. And that could help stop the provider rate cuts and maybe even give them a boost. McCleland: Would the tobacco tax be a long-term solution for Oklahoma’s state healthcare funding? Or is this just one step in that direction? Terry Cobo: Well, Nico Gomez says this is not a long-term solution. But it’s the most politically viable one. We hear time and time again, from hospitals to mental health care providers, that not expanding Medicaid did so much harm to the poorest and most vulnerable here in the state. But expanding Medicaid is just a non-starter for so many Republicans here. McCleland: Sarah, I want to talk about another story you wrote this week. This one is about franchises that cater to kids with special needs. What kinds of businesses did you find? Terry Cobo: Well, it’s pretty cool. One is called We Rock the Spectrum Gym. It’s a play place filled with trampolines, swings, slides and a zip line. All of that is occupational therapy equipment. It’s all padded and really colorful. McCleland: How does this business differentiate itself from similar businesses that don’t necessarily cater to kids with special needs? Terry Cobo: They won’t kick you out if your kid has a tantrum. So, children on the Autism Spectrum or who have sensory processing disorders can get overwhelmed and just have a meltdown. But here, they have a place where kids can go and calm down. They’re not going to kick you out. There’s just a general sense all children are welcome here. McCleland: Are specialists, such as therapists, are they often on-site at these types of businesses? Terry Cobo: That can be. Franchisees for We Rock the Spectrum must either have a child who has special needs, or they must work in the therapy profession, like speech, occupational or physical therapy. In this local instance, the woman who owns it, her daughter has a sensory processing disorder. McCleland: Are these types of businesses a growing trend across the United States right now? Terry Cobo: They really seem to be. And this franchise in particular is really growing. She started in 2013 and now there are more than 60 franchises across the United States and there are 26 under construction. So this is definitely an investment area for businesses looking to help kids with special needs.